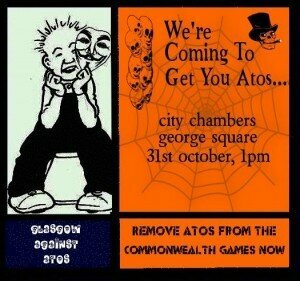 Lobby of Glasgow City Council, organised by Glasgow Against ATOS. George Square for a lobby of those councillors who are debating this motion. company’s involvement in the Commonwealth Games next year. FANCY DRESS VERY MUCH ENCOURAGED, ITS HALLOWEEN AFTER ALL SO IF YOU’RE UP FOR IT GET YOUR BEST HAUNTING GEAR ON !